The first award ceremony of the Duke of Edinburgh’s Award in Bangladesh was held on Sunday 31 May 2009 at the Bangladesh-China Friendship Conference Centre. Professor Dr. Alauddin Ahmed, Advisor for Education, Social Development and Political Affairs to the Prime Minister of the People’s Republic of Bangladesh was present as the Chief Guest of the Award Ceremony. State Minister for Liberation War Affairs, Capt (Retd.) ABM Tajul Islam was also present in the ceremony as a Special Guest and a Father of an Award Recipient. Mr. Osman Morad, Chairman of the Board of Trustees of the Award also spoke as a Special Guest of the occasion. The Duke of Edinburgh's Award Foundation, Bangladesh conferred Bronze Award on 261 students for their achievements in self-development skills and community services. 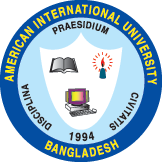 The educational institutes from where students participated in the first ever Duke of Edinburgh's Award include American International University-Bangladesh (AIUB), Bangladesh International Tutorial, Bangladesh University of Engineering and Technology, European Standard School, Dhaka University, Grace International School, Jahangirnagar University, Maple Leaf International School, Mastermind School, Oxford International School and United International University. The first batch of participants from AIUB participated in the Bronze category of the award and have successfully completed this first stage of the Award. Heads of the participating institutes, trustees, national directors and members of the Award Foundation were also present.